Dear Friends; We lost a great man on July 2nd 2017. Dr. Hamer passed away peacefully at his home in Sandefjord, Norway where he lived in exile. He was an extraordinary man with a brilliant mind. In a short 35 years he managed to understand the cause of all diseases and how to heal from them. His discovery of "The New Medicine" will change the face of medicine as we know it. Thank you Geerd for your gift to humanity. Viva La Medicina Sagrada! In the spirit of the Germanic/German New Medicine, we offer a word of warning. Dr. Hamer’s language and his approach to medicine, disease and the causes of disease may be something of a shock to those of us who are accustomed to modern Western medicine as it has been practiced for the last fifty years. 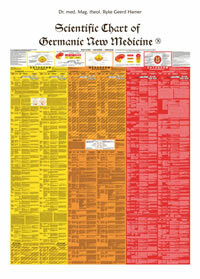 In 2003 Dr. Hamer decided to copyright the name " New Medicine". Unfortunately he was unable to do so and decided to call his work "The German New Medicine" which was successfully copyrighted, in honor of his heritage and place of birth where he first discovered the scientific connection between the Psyche, Brain and Organ. Since this web site has been up and running since 2001 we have decide to keep the name "New Medicine" to accommodate those of you who regularly pay visits to this site. Please rest assured that all the information on this web site is on Dr. Hamer's approval and up to date. GNM Education at GNM Online Seminars. The Scientific Chart is integral to understanding biological conflict responsible for all diseases. It is designed to help you to determine where the disease process is within the Second Biological Law, the "Law of Two Phases". It comes complete with expanded index which replaces chapter 12 in the "Summary of the New Medicine". The Scientific Chart is a must have" if you already own the "Summary of the New Medicine"
We will keep you posted on new developments, seminars and publications in English. It recently came to my attention that my private e-mail had been compromised. The missing files were recordings of Dr. Hamer in conversation with 2 interested parties that wanted to know the truth about the allegations Caroline Markolin had made against me on her website. In recent discussions with Dr. Hamer it has come to our attention that Caroline Markolin has decided to become the voice of Dr. Hamer without his knowledge or permission. This self - imposed authority has resulted in vicious, uncalled for attacks against the owner of this web site, Ilsedora Laker.